For the past school year, I have spent an hour every Friday at a Salem elementary school reading to two students as a SMART volunteer. When I was asked to volunteer for Start Marking A Reader Today, I was worried — worried I didn’t have the time to commit to volunteering and apprehensive I wouldn’t teach the students well enough. On the first day, my jitters melted away and it became a simple task. I showed up, I smiled and I read. Each week we’d catch up on how her pets were doing and whether her older brother was still giving her a hard time, as mine did. Then we’d pick a couple of books to read. We both loved dog books. We worked a lot on sounding out the words. She was great at guessing what the next word might be based on context and pictures, but over the past few months she grew as a reader and not a guesser. He was a big fan of Star Wars and superheroes. And SpongeBob, of course. For him, it wasn’t about the act of reading. It was about making sure he had access to the resources and support he needed to develop as a reader. And it was about knowing someone cared. He can read better than most his age, but that doesn’t mean he always has the chance. By allowing the readers to be comfortable trying, even if that means making mistakes, they learn more and grow in confidence and trust. I have to keep in mind that I am not there to discuss the literary elements of a remarkable story. 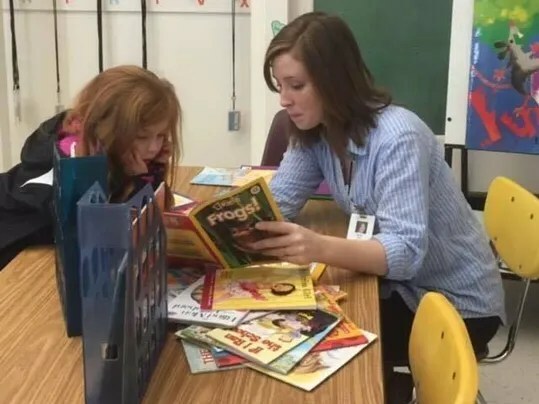 I am there to help a young student learn and appreciate reading, the same way my parents and teachers patiently helped me when I was growing up. If a student doesn’t get a word right, or doesn’t remember something from the week before, that doesn’t mean he or she isn’t learning. It means the student still is grappling with the concept and perhaps I need to find another way to help him or her so it solidifies. Although reading comes easily to some, it is easy to forget that isn’t true for everyone. We need to make sure everyone can read. Adjust to the skill and speed of the reader and figure out what he or she needs. On the days I was tired, upset or extremely busy, I needed to let all that go and show up at school anyway. The best way to do that? Be in the moment with the kids and rely on each other. Laugh at their jokes, read in ridiculous voices and smile. When you see a student struggling, pushing through isn’t always the answer. We don’t want to push students so far they never want to read again. Taking time to cool down and reset can be the best solution. When my freckled buddy didn’t want to read, we looked at the pictures and created our own story line, or we talked about her pet bunny. What is important is that you are there. The organization has 267 programs statewide, 355 site coordinators, 4,624 volunteers and 114,750 books given away this year to the 10,101 children it serves. Go to getsmartoregon.org/get-involved or call 503-391-8423.